B Vitamins are essential. 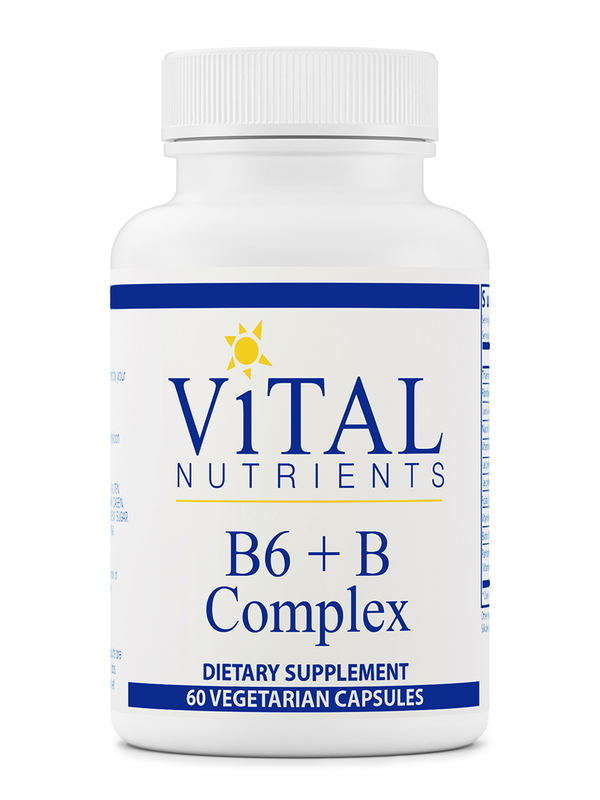 I have been using B6 + B Complex by Vital Nutrients for several years. I began to use this formula by recommendation of my physician to support me in handling stress. This formula has extra dosage of B6. I had been using it for more than 6 months. Nutritional doctor recommended B6+B Complex by Vital Nurtrients as part of my supplemental nutrition during chemotherapy. I am very pleased with the product and feel it is a great product for the price! You may have heard of the fairly widespread phenomena of the power of B-vitamins and their effect on the body‚ which has been seen as an essential component to your ongoing wellness. B- vitamins may sound like a large and unwieldy group of nutrients‚ but the essential B vitamins are actually contained to 8 different B varieties. Together in a supplement‚ these 8 vitamins can be referred to as a B-complex. There are many ways to supply these B-vitamins to your body‚ but many people have found that taking a dietary supplement can provide nutrition in an easy and inexpensive manner. 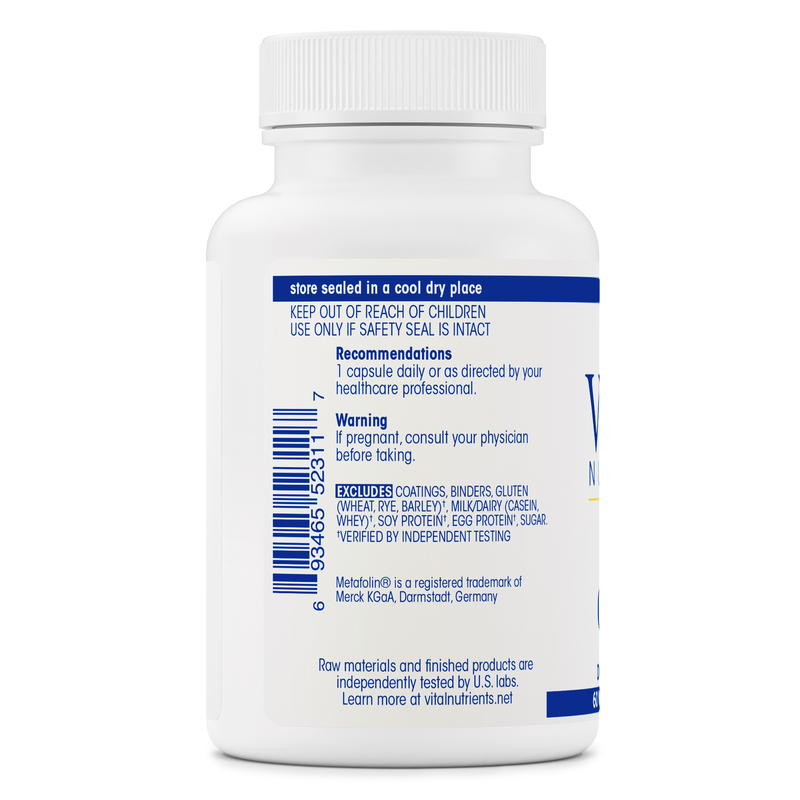 B6 + B Complex 60 Capsules by Vital Nutrients allows for total coverage of B-complex benefits‚ with an extra high dosage of vitamin B6 to give off more specific benefits‚ such as female support. Some things that a B-complex supplement may be able to promote include protein‚ carbohydrate‚ and fat metabolism‚ as well as homocysteine conversion support and in turn‚ more sustained heart health. In total‚ this also may produce an easier and more tuned nervous system‚ for increased vitality. The ingredients include extracts of thiamin‚ riboflavin‚ folate Metafolin (as L-5-MTHF)‚ vitamin B12‚ biotin‚ pantothenic acid‚ riboflavin 5' phosphate‚ niacinamide‚ pyridoxal 5' phosphate‚ and a increased dosage of vitamin B6‚ as pyridoxine HCl. 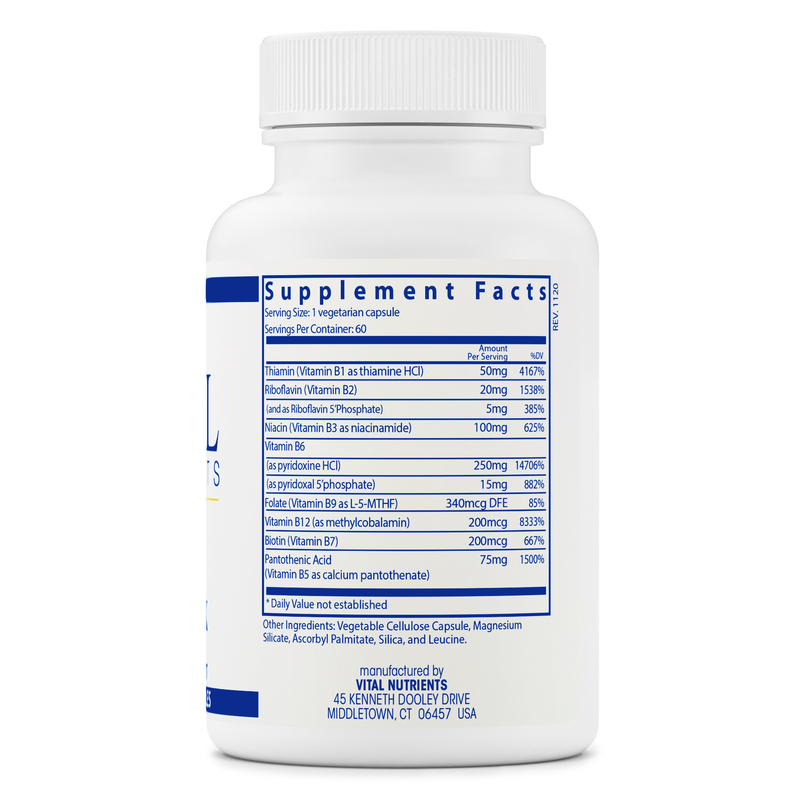 Vital Nutrients supports research to confirm that you are receiving the safest supplement possible. This product has been independently tested for authenticity‚ potency‚ solvent residue‚ stability and bacteria‚ and yeast and mold counts. 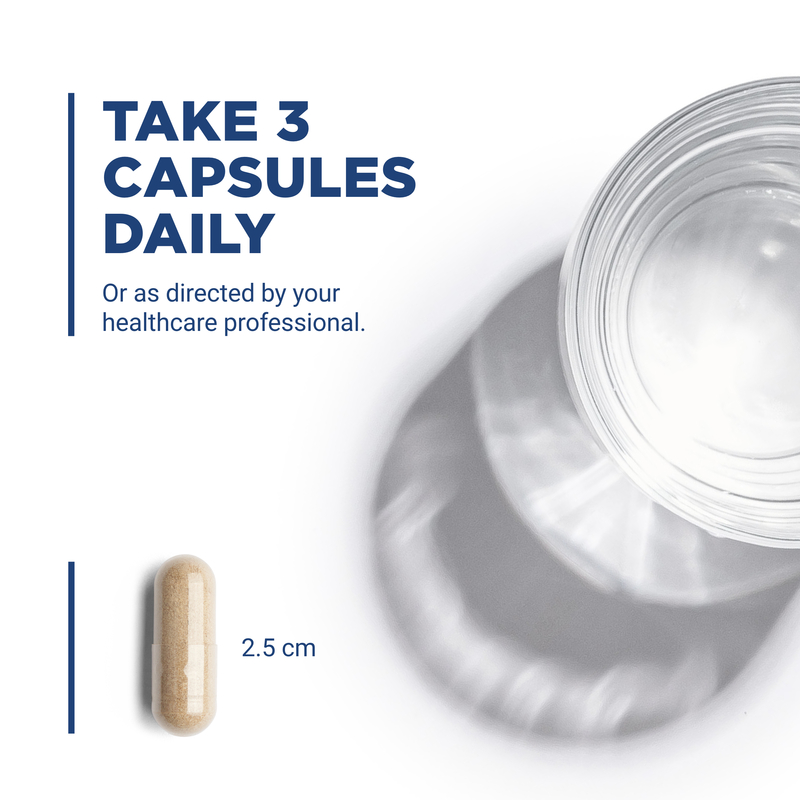 Each 60 capsule bottle of B6 + B Complex by Vital Nutrients should last 1-2 months at the recommended dosage of 1 capsule daily‚ or as recommended by a healthcare professional. Other Ingredients: Vegetable cellulose capsule‚ magnesium silicate‚ ascorbyl palmitate‚ silica‚ and leucine. I ordered that product as a recommendation of a naturopath and it did what expected. Also the service was fast and the price good. I would order B6 + B Complex by Vital Nutrients again, and of course recommend to others. The fast service, the price, and that it meets the expectations. Nutritional benefit for the price! These B vitamins are great. ND recommended B6 + B Complex by Vital Nutrients for my heart. Good supply of pure B Vitamins.